We harvest our spinach either as baby size (packed in bags) or when slightly larger in bunches. The smaller the leaves, the more tender, and better for eating raw in salads. When you get bunched spinach home, untie it, remove any blemished leaves, trim off the stems, and wash it thoroughly in cold water. Repeat if necessary until you're sure all the grit is gone. Spin dry in a salad spinner or drain well, then put into clean plastic bags very loosely wrapped with paper towels. It will last only two to three days, so plan on eating your rinsed spinach right away. Cold, moist surroundings, as low as 32°F and about 95% humidity are the best for storing spinach. Do not store spinach in same bin as peaches or apples as these fruits emit ethylene, an odorless gas which will turn greens yellow and limp. 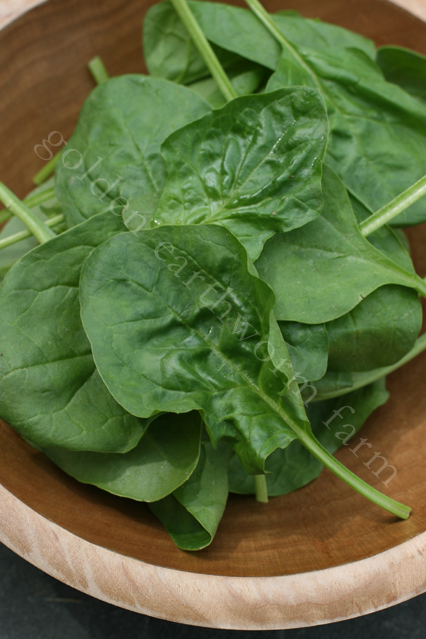 Tender, fresh spinach is delicious in salads, pasta, soups and dips and is an easy, healthy addition to many meals. So many ways to eat it raw or cooked! Great for green smoothies or juicing.